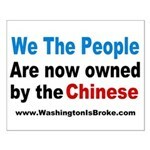 tea party | Washington Is BROKE! This is my video response to teapartytracker.org's complaining about "offensive" TEA Party signs. RATED R! If you don't wish to hear foul language and/or Rap music, mute your sound. In this country we look forward, because forward is the only direction to move. A few weeks ago we were looking forward, and the only people we saw moving in the same direction were the people to our sides. The people who believe the word “citizen” means something. I've made up some TEA Party signs, posters, T-shirts, etc. for the upcoming protests. If you're like me and don't have the time to run around buying poster board and making up a sign, this is a good alternative to making your own. Time is running out for the April 15th rallies! Click on an image to be taken to the store. If you have a slogan you want on a sign, contact me and I'll have one made up real quick.